Celebrating a nearly 60-year run of genre-defining comics, cartoons, and cinema, the Justice League continues its unwavering duty of uniting DC Comics’ legendary lineup of idolized icons against formidable foes no hero could save the world from alone. In anticipation of the team’s first big-screen blockbuster Justice League smashing into theaters this year, we’ve put together a list of must-have Japanese figures that any collector would be proud to assemble in their display case! Unite the League in figurine form with the ARTFX+ Justice League Movie Collection. These fixed-pose sculptures stand firm—on magnetized bases—against the movie’s supervillain while boasting precise details worthy of Superman’s telescopic vision—a heroic feat at a modest 1/10 scale. Each actor’s face and the textures of their costumes are rendered as though they’ve leaped straight from the big screen. The entire collection will be striding boldly onto retailers’ shelves shortly following the movie’s release, which means you can relive the cinematic experience long after the credits roll. Believe it or not, these pictures aren’t movie screenshots—they’re highly poseable collectibles that use digital coloring to uncannily capture the likenesses of Ben Affleck and Gal Gadot in their superhero roles as Batman and Wonder Woman. With an arsenal of interchangeable hands, heads, and weapons, as well as a wire-malleable cloth cape for Batman, these S.H. 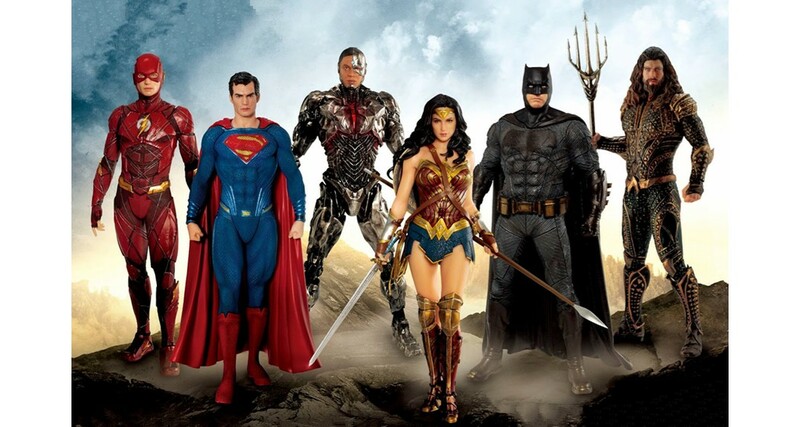 Figuarts Justice League Movie Figures allow fans access to the full range of each character’s dramatic flair for comic book heroics. As the perfect complement to Kotobukiya’s new Movie Figures Series, ARTFX+’s DC Universe Super Powers Classics Series includes all the members of the original 1960 Justice League team (minus Martian Manhunter) at a matching 1/10 scale. Each fixed-pose sculpture comes with a variety of nostalgic details harkening back to playthings past, like faux articulation joints and cloth components used for Batman’s and Superman’s capes and Wonder Woman’s lasso. Superman even comes with an alternate “swinging arm” attachment simulating the uppercut effect the original action figure had when squeezing its legs. The Variant Play Arts Kai DC Universe Series fuses the Justice League’s classic colors with a metallic finish that’s sure to stand out in your collection. Equipped with a variety of optional hands and kinetic superpower effects, Play Arts Kai complements its customization with towering size, intricate articulation, and muscular sculpts for power poses of epic proportions. Professional window-box packaging and character bios printed on the inner flap complete each figure for a vibrantly edgy spectacle. Nendoroid shrinks three of DC’s most powerful heroes down to chibi size while preserving the modern interpretations of their iconic suits and weapons as portrayed in the two lead-up blockbusters to the upcoming Justice League film. Plenty of props like Wonder Woman’s glowing bracelets, the Bat Signal, and the Kryptonite spear are included for recreating key scenes of diminutive derring-do. Whether you were drawn to the powerful portrayal of Wonder Woman in her 2017 stand-alone feature or took sides in 2016’s Batman v Superman: Dawn of Justice, you can pay tribute to the century’s most spectacular superheroes in kawaii style, thanks to the Nendoroids’ intuitive articulation, mid-air poseability, and battle-ready parts. If you think the Nendoroids’ chibi-size renditions are a little too cute for the darker tone of the DC Universe, these Variant Static Arts Mini DC Comic Figures are a statuette alternative that give each hero’s signature features a playful anime alteration—making even Gotham’s gritty antihero look more grumpy than grim. Vibrant colors, flowing layers, and defined silhouettes combine forces to create a series of compact collectables appealing to otaku and Justice League fans alike. Bringing character designer Shunya Yamashita’s illustrations to life at 1/7 scale, Kotobukiya’s Bishoujo Wonder Woman Statues fully portray her peerless beauty and prowess as a warrior. One sculpture captures Princess Diana extending an elegant leg as she fearlessly descends into battle, bearing her gauntlets or wielding her optional Amazonian dagger. The dashing demigoddess takes a more sentinel stance in her second sculpture, holding her Lasso of Truth at the ready as she stands amidst Amazonian armor and weaponry while an unseen wind blows through her raven-colored hair. ARTFX+’s Superman “Rebirth” Figure commemorates DC Comics’ continuing 2016 reboot event “Rebirth,” which outfits classic characters with recognizable redesigns. The Kryptonian colossus is sculpted as though staring down an unseen enemy with his steely blue eyes and undaunted expression. Crimson cape billowing heroically and powerful fists at the ready, Superman cuts a striking figure in his muscle-bound blue bodysuit, emblazoned with the famous “S” insignia on his chiseled chest. At a compact but detailed 1/10 scale, he can easily leap into any collection with a single bound. Batman meets Final Fantasy in this radical reimagining by renowned Square Enix character designer Tetsuya Nomura. Garbed in a midnight-black armor detailed with red accents, the Caped Crusader takes on a sharp, sinister appearance. Bat-like claw extensions and fully poseable wings lend portentous personality to this highly articulated Play Arts Kai figure. With an acceleration booster embedded in his chest and an arsenal of Batarangs hidden inside his leg plates, this Batman will certainly keep collectors guessing whether he’s more man or machine. For every era of lawlessness in the annals of history, there has always been a Batman. This idea is the driving force behind Play Arts Kai’s “Timeless” Batman Series, which incarnates the masked vigilante into the battle-worn boots of strong, silent warriors of the past—from a scarred Spartan and justice-seeking samurai, to a lone-wolf gunslinger and tech-savvy steampunk engineer. Fully articulated and decked out in unique Batarangs, grapples, weaponry, and period-appropriate armor, perhaps the one thing these historical heroes hold in common (besides their grim exteriors) is a breastplate emblazoned with an omen to all adversaries of good—the bat insignia. Whether you’re super-hyped for the 2017 Justice League film or nurturing nostalgia for DC’s greatest team of comic book characters, be sure to unite these Japanese figures for your collection. With the help of a superpower proxy service like FROM JAPAN, you can easily have these heroes and more shipped from Japan to your doorstep! And for more Japanese comic book collectibles, be sure to swing over to our list of friendly neighborhood Spider-Man figures. Japanese Star Wars Merch That Will Throw You into Hyperdrive!